Hydraulic Hoist Market size will exceed USD 417 million by 2025; according to a new research report by Global Market Insights, Inc.
A hoist is material handling equipment used in various end-users like metal processing, chemical, automotive, etc. These hoists are used to transfer heavy weight objects and materials easily from one place to other. The hydraulic hoist market is expected to grow significantly over the coming years, due to the increasing product demand from various end-users including metal processing, chemicals, construction, etc. Increasing industrial activities globally, along with rising urbanization in the developing countries of Asia Pacific and the Middle East are creating a significant demand for hydraulic hoists over the past years, and this is expected to rise moderately till the end of the forecast period. Major restraints include the competition from the electric hoists, coupled with the lack of technical expertise to operate the hydraulic hoists. Additionally, the requirement to service the hoists regularly will also show a negative impact on the growth of the global hydraulic hoist market over the forecast period. Manual chain hydraulic hoist market will cross USD 370.0 million by the end of 2025, growing at a CAGR over 5.6% over the projected period. They provide very high load capacities, compared to lever hoists. Moreover, the hydraulic chain hoists are east to operate than lever hoists. These factors are responsible for the growth of manual chain hoists over the forecast period. 0.5 – 20.0 tons load bearing capacity range of manual chain hoists will hold the highest share of the total manual chain hoist market and will cross USD 240.0 million by the end of 2025. 5.1 – 10.0 tons load bearing capacity range of hydraulic lever hoists will have the major chunk of global manual lever hoist market in 2017, and this will cross USD 35.0 million by 2025, at CAGR more than 5.3%. Asia Pacific manual hoist market is expected to cross USD 140.0 million by the end of 2025, growing at a CAGR of over 5.9%. 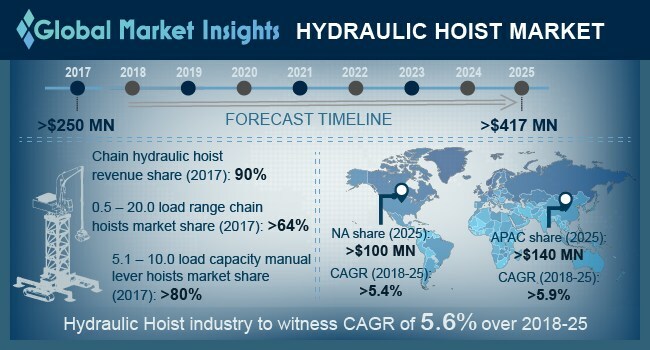 North America regional market has the second largest share of the global hydraulic hoist market, and it will cross USD 100.0 million by the end of 2025, at a CAGR over 5.4%. Key companies in the global hydraulic hoist market are Ingersoll-Rand plc, Columbus McKinnon, KITO Group, Harrington Hoists, Inc., JDN Group, Vital Chain Block, OZ Lifting Products, Venus Engineers, Tractel, and Vulcan Compagnie de Palans Ltée.